My son’s first day of third grade is tomorrow, so last week I started looking for clever lunch ideas for him. This frozen smoothie idea is genius because it will keep his lunch box cool and give him a healthy treat that I can feel really good about. I bought these plastic freezer containers that Ball makes and they’re the perfect size. I made our favorite smoothie recipe in the food processor and it made enough to fill 5 containers plus some extra that the kids happily shared. After they were all nicely portioned I wiped the rims well, sealed them up and stowed them in the freezer. All he needs to do is stir it up once it’s lunch time – I’m hoping that it is soft enough for him to drink, but not too soft that it becomes watery. Verdict: Yay! I am pleased to report that Little Boy M had a great first day and the smoothie thawed out enough and he happily ate it with a spoon. He also reported that his juice box was nice and cold, too. I asked him how it tasted and he said it tasted like one I just made for him. I think I might have to buy more of the freezer jars because both my kids are going to expect these everyday in their lunches. Best. Idea. Ever! Thanks for reading, enjoy! It couldn’t be easier! Pour all your ingredients in a food processor and blend away! 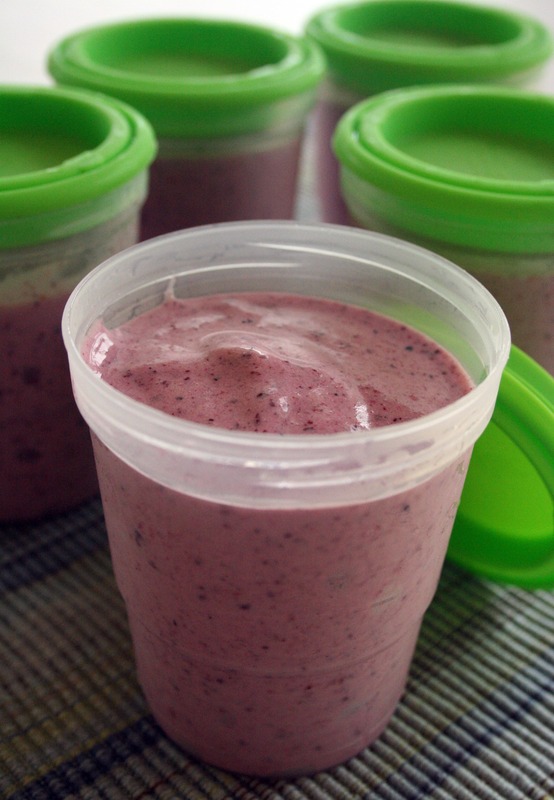 Spoon the smoothie into the freezable Ball containers, wipe the rims and place in your freezer. Enjoy! The bananas don’t turn brown in these? Hi, Megan! The smoothies defrosted enough to drink about 3-4 hours, maybe less depending on how hot it is or how well insulated the cups are. Thanks for stopping by!